Home Fitness Kill Back Pain With These Exercises! Your back muscles are some of the most important muscles of your core, especially those of the upper back, which are what help us have good posture. Or at least we wish we had good posture, right? To work the upper back, you typically do a lot of pulling and rowing motions – Kind of like the moves you do when you work your lats, except the emphasis and positioning changes so that your upper back is doing all the work. Barbell high rows are perfect for working those upper back muscles, particularly between the shoulder blade. 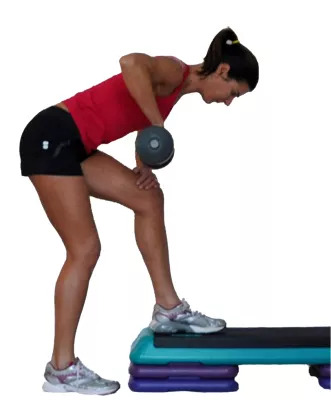 The key here is to, first, keep the knees slightly bent to protect the lower back and engage the abs. You want to bring the barbell up to your chest rather than to your belly button, as you do with regular barbell rows. Reverse flies are one of my favorite ways to work both the upper back and the rear delts. The real key to this move is, first, go a little lighter here to get your form down. Second, don’t jerk the weights up. You want to lead with your elbows, but stop when you get to torso level. Too often people try to pull the weights way past their bodies, which isn’t very effective. 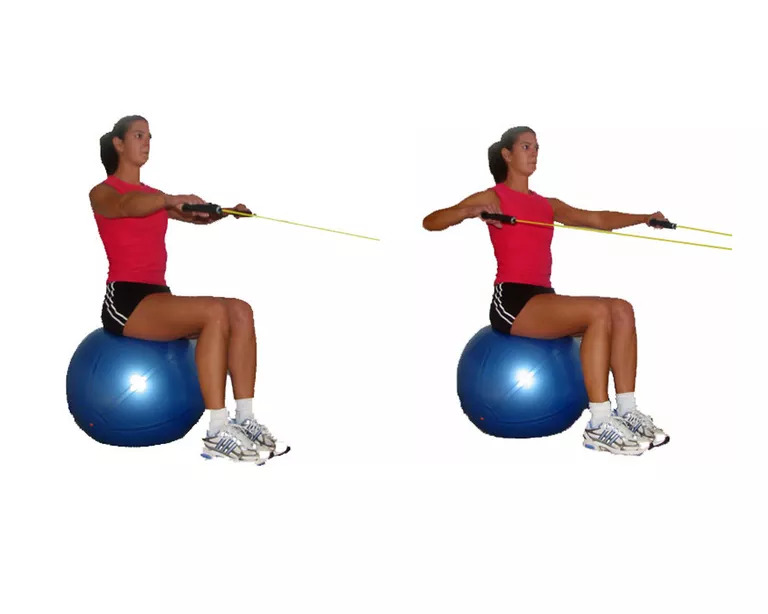 I love the resistance band for working the upper back, especially these t-pulls. With these, you loop a band around the feet (I have a flat band, but you can use a tube as well) and you keep the arms straight as you pull the arms out to the sides, like a T. Hence the name. The name of this exercise also describes the movement you should do. 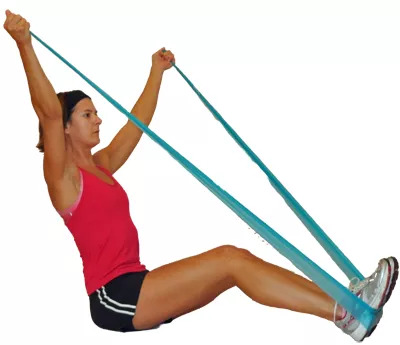 Like the T-Pulls, you loop the band around your feet and now bring your arms up into a y-position. Really squeeze the shoulder blades here to feel the muscles of your upper back. For more intensity, alternate a T-Pull with a Y-Pull. 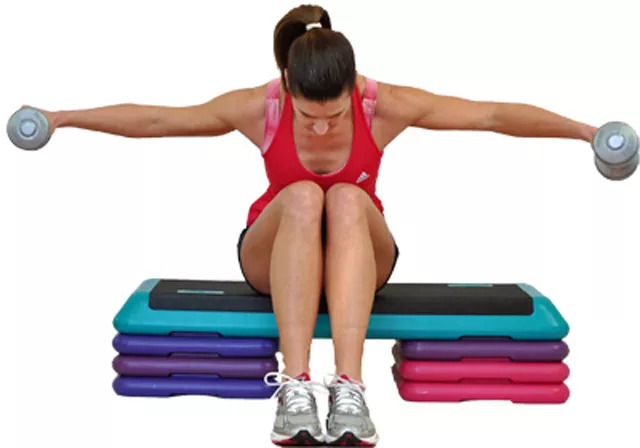 This is a simple way to work the upper back when you don’t have much equipment or space. You simply hold the band straight in front of you and open up the arms, squeezing the shoulder blades. You’ll want plenty of tension in the band and you’ll also want to keep the arms mostly straight, just a slight bend in the elbows. One of the most effective ways to target those posture muscles is with high rows. 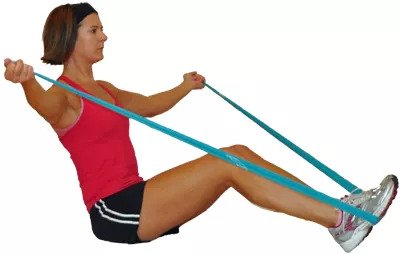 With the band anchored in front of you, you want to pull the elbows back so that they are level with the shoulders and parallel to the floor, really squeezing those shoulder blades together. I love this exercise! You’re basically in the same stance as a regular one arm row, but your palm is facing the back of the room. 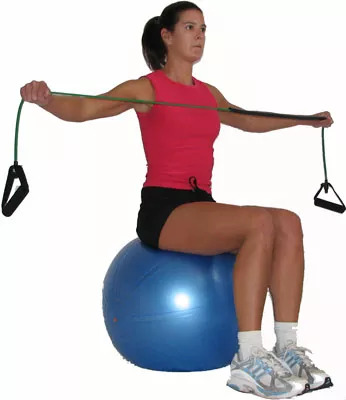 So, as you pull the weight up, your elbow flares out, perpendicular to the body. It’s kind of like you’re pulling the weight up towards the armpit. So the focus is on the upper back rather than the lats.